Mór is the home of “Ezerjó“, an excellent white dessert wine. Mór is located in a valley between Vértes and the Bakony Mountains. 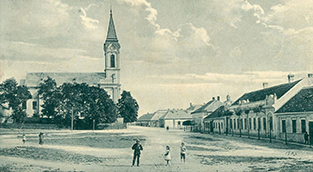 On recommendation of the family of Hochburg, German settlers came to the area in three waves of migration in the first half of the 18th century. Most of them came from Austria, Bavaria and the Black Forest. Two castles, which are still in good condition, can be found in Mór. 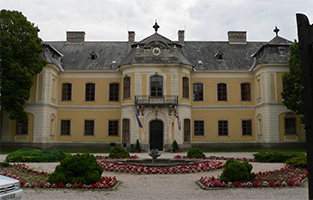 Castle Luzsénszky or Láncos which was builit in 1790 in the so called “Zopfstil”, a style between Rococo and Neo-Classicism. Today, city hall and the town administration can be found here. The second, Lamber Castle, a baroque building, was built between 1762 and 1766 by the court constructor Jakob Fellner and Count Anton Lamberg. It nowadays holds the local history museum with a “Swabian Parlour” and a local history collection with artefacts from coal mining and a miniature of the Battle of Mór, which took place on the 30th of December 1848. One room commemorates Sándor Wekerle (1878-1963) who was born in Mór and became the first non-aristocratic prime minister of Hungary. Mór’s characteristic “monuments” of viticulture are the wine press houses and cellars which were located on outskirts of the town and show baroque, neo-classical and romantic features. Many of them have been demolished or rebuilt and are used as residential houses or offices now. On the Hársfa utca (Linden Street) some historically preserved wine cellars can be seen such as a cellar from 1771 which has recently been restored and a press house from 1926. After a cattle epidemic in 1742, Josef Weber and his wife had a chapel built in 1746 in honour of Saint Wendelin and Saint Lenard. The Chapel of Saint Rochus – a neo-gothic chapel with a pointed, helmet-like tower on its left-side façade, was erected in 1836 as a memorial to the cholera epidemic of 1830. The baroque Chapel of Saint Urban (1794) is located on Kacskehegy (goat mountain) under an enormous tree – a vinyard chapel. The baroque wooden alter of Mór Árkipuszta Chapel, dedicated to Saint John of Nepomuk, is Mór’s most important monument of cultural history. Until 1950, the chapel was used as a private crypt. In 1994, the city of Mór built a World War II memorial depicting Saint George. A memorial by Rigó István for the occasion of the 300th anniversary of the German settlement and the 50th anniversary of the German displacement (1998) is located in the Park of the Mille-Centenary. A bronze statue of Saint Gisela (consecrated in 2001) commemorates the wife of state founder Stefan I. The statue was erected as a symbol of the peaceful cohabitation of German and Hungarian residents. 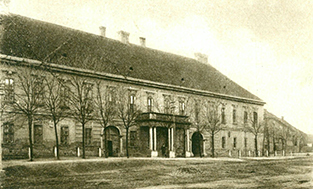 Erzsébet Square in Mór around 1903. Castle Luzsénszky, built in 1790. Memorial for the 300th anniversary of the German settlement and the 50th anniversary of the German displacement. 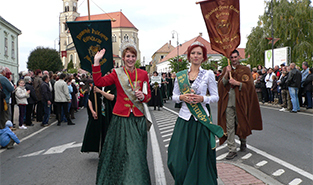 The Mór Wine Festival is internationally renowned. It is tied to the time of grape harvest and is held yearly on the first weekend of October by the local autonomy and the viticultural societies. 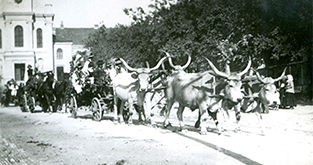 It was held for the first time in 1934 and aimed at making the wine of Mór better known. Furthermore, the city holds a yearly brass instrument and folklore dance festival at the same weekend with performances by international folklore groups. 1. 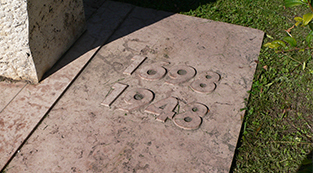 March – 31. October: Tuesday to Sunday: 9 am -5 pm, closed on Monday. 1. November – 28. February: Tuesday to Sunday: 10 am – 3 pm, closed on Monday.